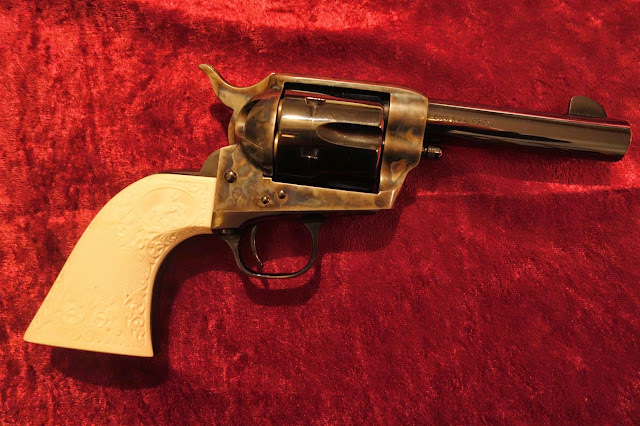 A quick look at the early USFA guns built from Uberti parts. Back of the hammer with a small screw on the top of the hammer. and the extra milling done on the earlier guns under the hammer for the hammer safety. And the hammer that fits the early additional milling on the Ubert/USPFA frames. 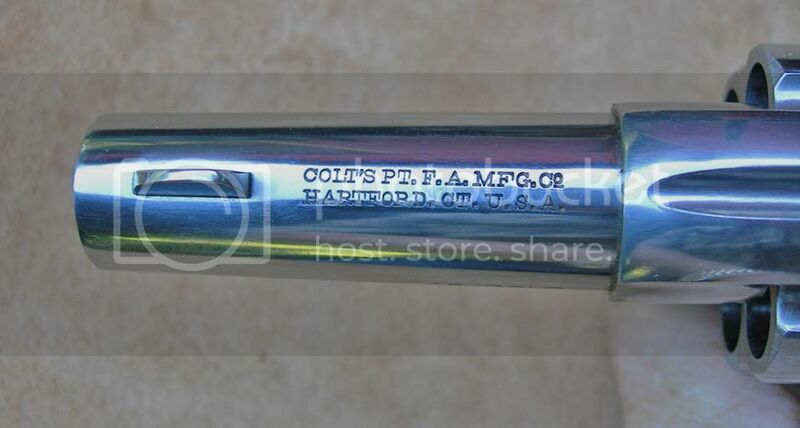 These USPFA gun will typically have a P stamped above their Serial number on the frame. The loading gate axle/ shaft configuration can sort out a USA made gun pretty quickly but not always. 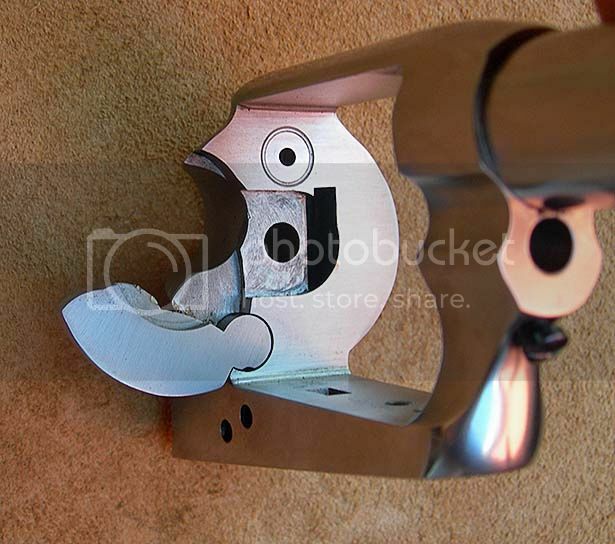 It is just one part and the USA versions made by USFA will fit either a Uberti USFA or a USA made USFA frame. Just another target indicator. 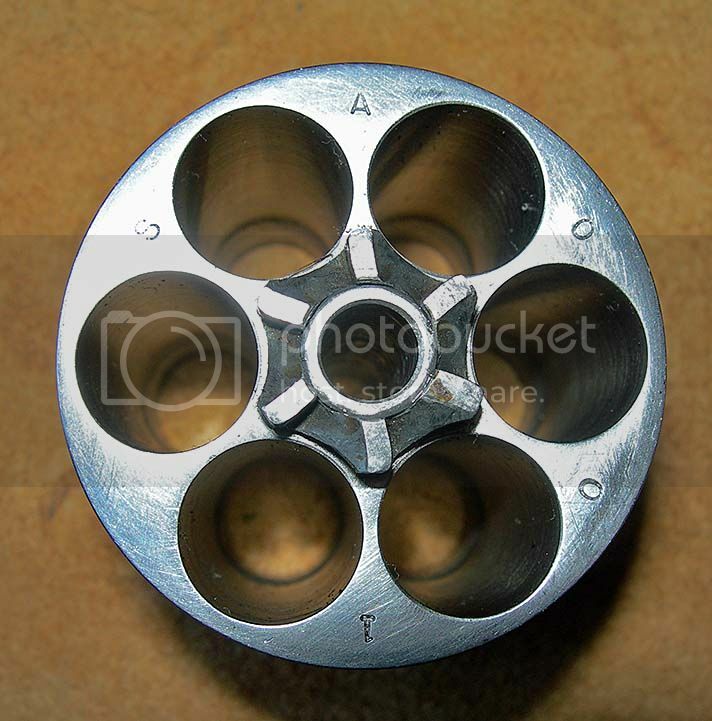 This is a USA made USFA gun looking down at the gate when it is open and cylinder out. Not the small shadowed "V" in the bottom right/center of the photo where gate and frame meet. This is a 1s Gen Colt. Much smaller V in the same place. and a unfired 2nd Gen with grease in the seam line but same as a 1st Gen gun. a 3rd Gen second year production and a much larger "V" at the frame/gate transition. 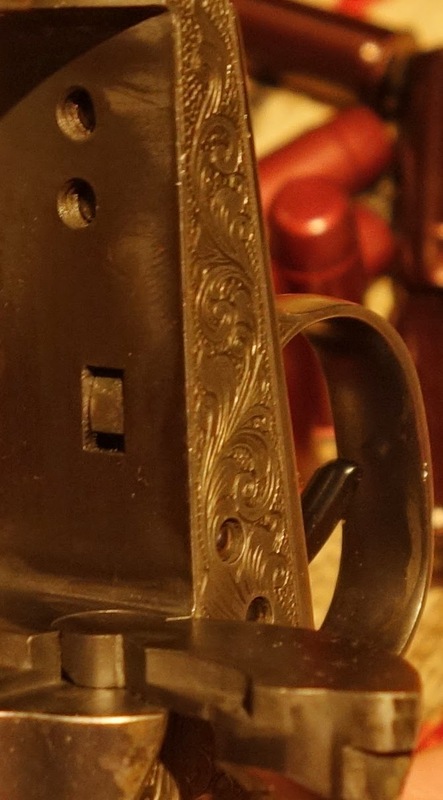 Ad this is a square cut notch on a current Uberti gun (8/25/18) and the earlier USFA/USPFA guns. 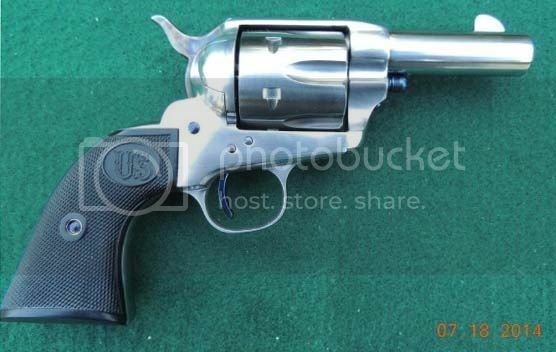 Uberti or USFA or a parts gun? Is it Real or is it Parts? The more I know about USFA the more I realize that how the guns were built often follows no rhyme or reason for parts or serial numbers. Don't get me wrong I think the 100% USA made USFA guns are some of the finest SAA hand guns ever built. But not every USFA gun is of the same quality either. Much of the famed quality built into the USFA guns from the very beginning, is without a doubt in my opinion, based on the exceptionally skilled craftsmen that put them together. That despite the quality of parts used at different times in the company's short history. I wish I had a list of the very skills craftsmen that put the guns together. I'd like to thank them personally for the guns that I get to shoot and pass on to my family. Hopefully this info will help others find value and a lttle of the history in their own USFA guns. There are a number of things I put on a check list to tell a Uberti frame from a USA made frame, and a "parts gun" labeled USFA but built on either frame with a mismatch of parts. None of these "checks" how ever are a full proof means of identification on a "parts guns". 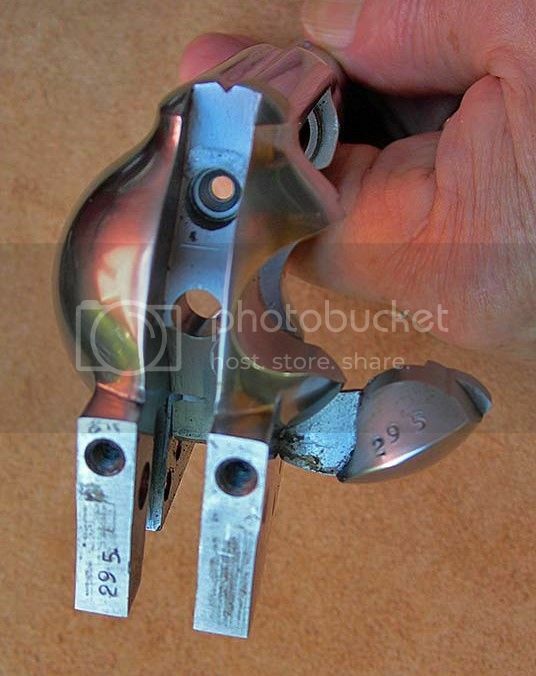 A check of the frame at the loading latch, with the cylinder out of the gun is the only known definitive test for a Uberti frame compared to a US made frame. And even with that I would not ignore the obvious if things don't jive. One thing I have learned with USFA..."never say never!" As a start. 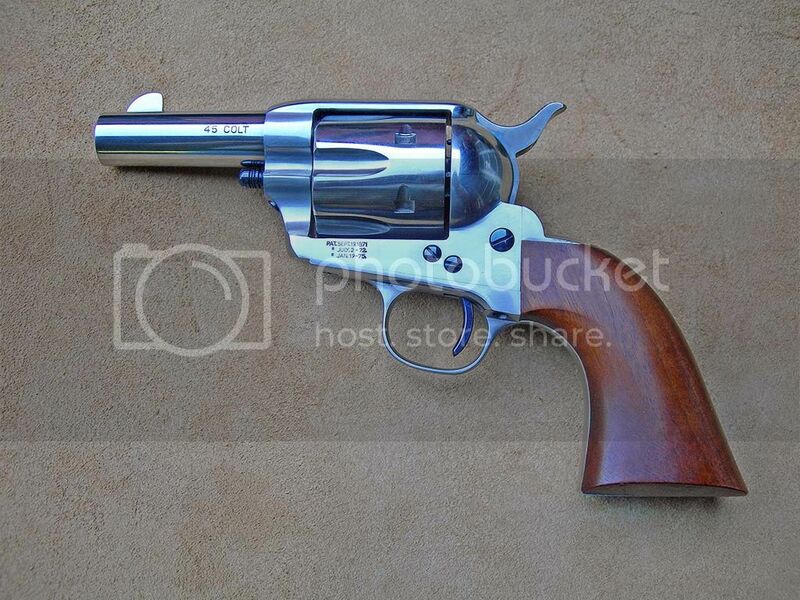 "Uberti parts were still used up through the 20XXX and 21XXX serial range." Credit must go first to past employee of USFA, Gary Granger, for giving us all a look inside USFA while he was working there. He was the "face" of the company for may of us originally. And has continued to help the USFA owners long after the company was history. 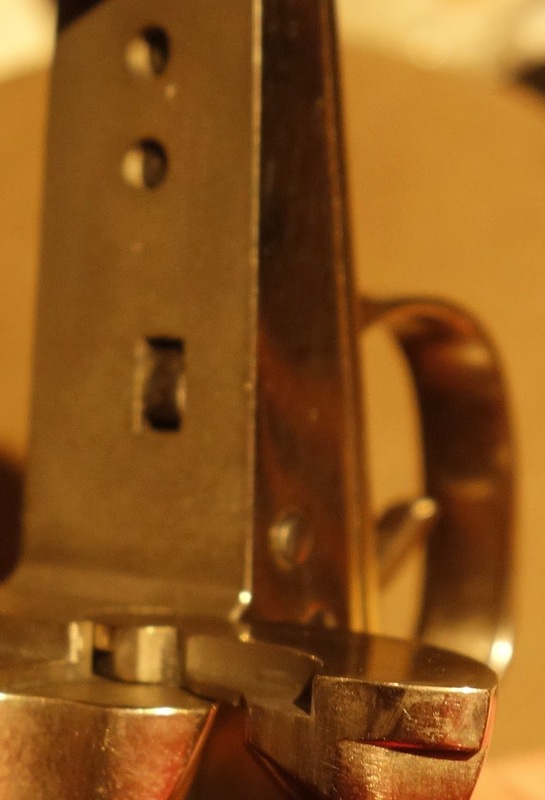 The frame hole at the pivot pin bottom/recoil plate, bottom left of the picture on a Uberti frame. Other details I now look at /for. USFA marked on the barrel. Not USPFA. Front sight profile? 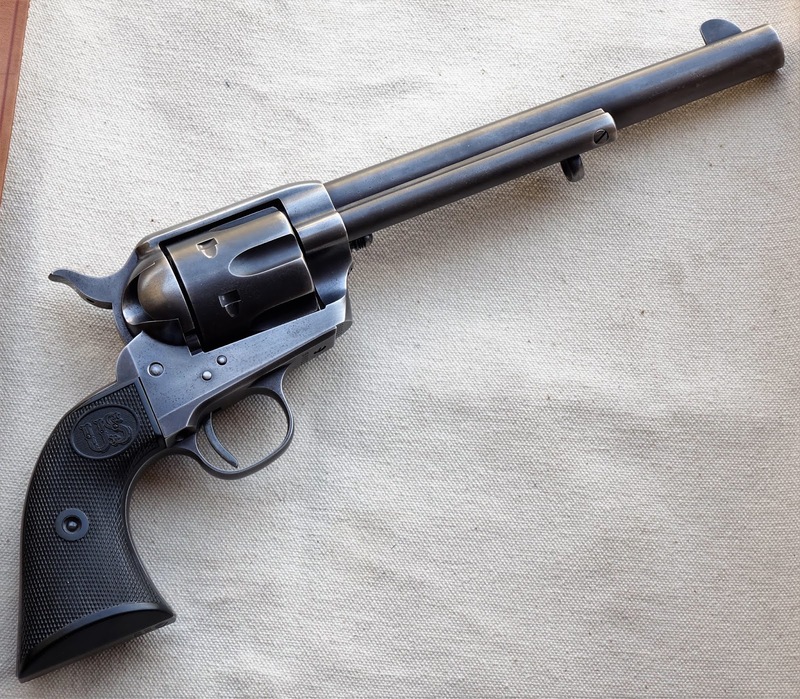 Uberti is generally more rounded and ramped on the front side. USFA are generally more vertical on the front side or even slightly over hanging and less curve across the top and back down to the barrel. "I'm sure there 's exceptions." 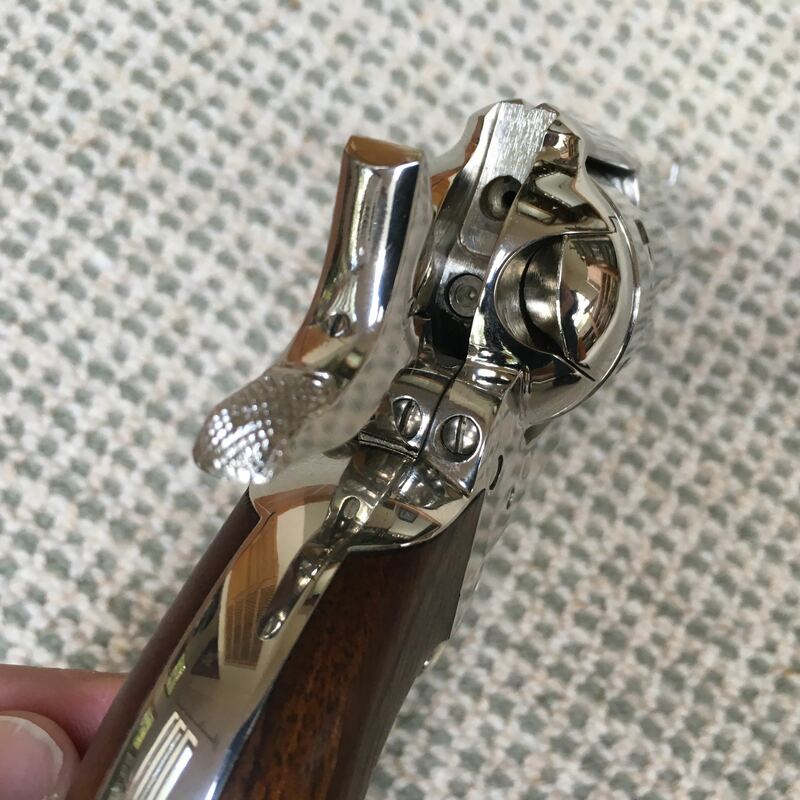 2 Line/3 dates: Cross pin frame and Bisley"
Wood grips on the US guns? Pronounced flats on the grip to frame junction might well indicate a Uberti gun. USA guns have better profiled grips behind the frame and trigger guard. 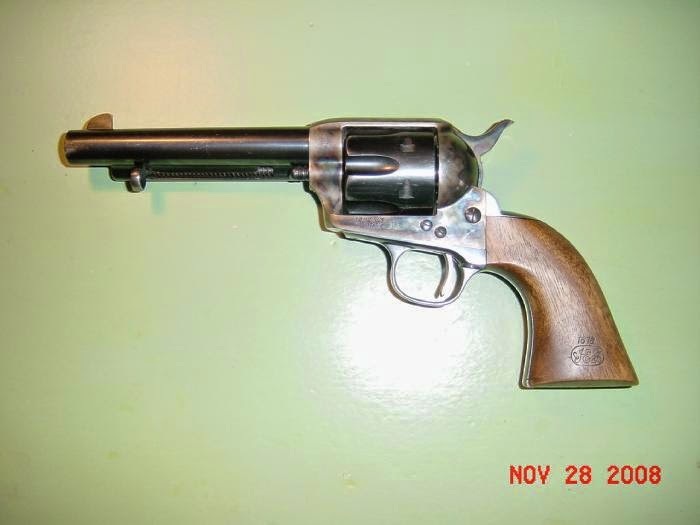 123093 is a early Uberti Neddleton with a USFA roll marked barrel built "under the blue dome". 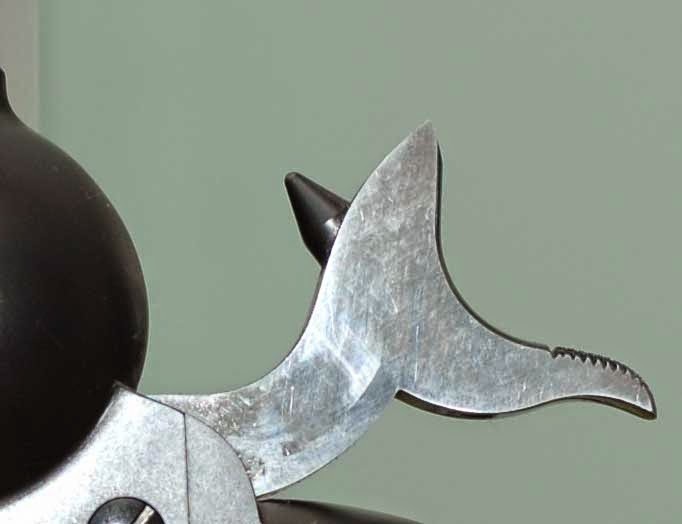 Uberti is typical a 1st generation style cocking serrations on the hammer. hammer and not cast. Below are three hammer cocking serration styles. 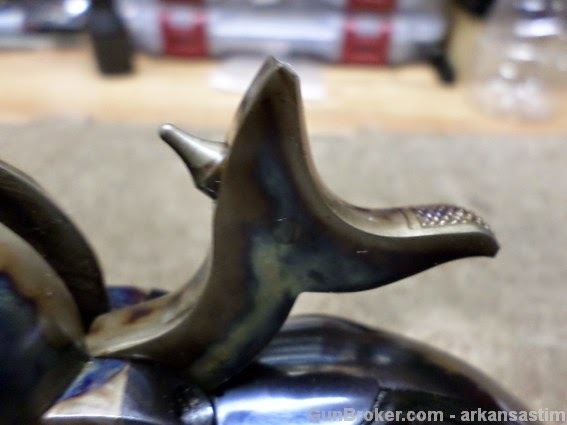 Uberti as well but on a cast hammer. Firing pins? USFA used both on occasion. Uberti only the tapered pin. More typical USFA Cone shaped firing pin. a milled hammer and hand cut and sharp cocking serrations. 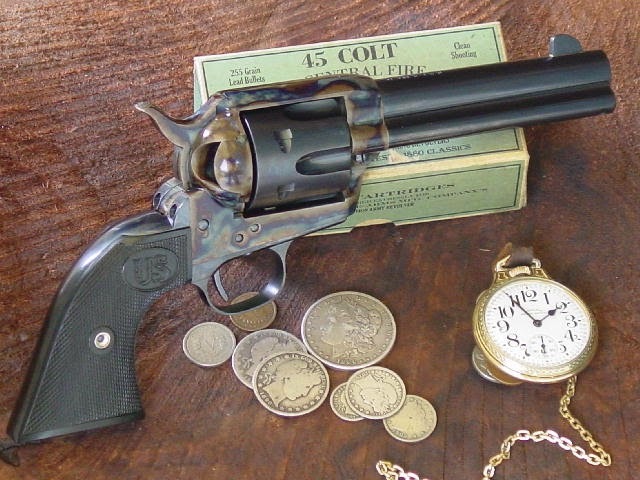 "7-1/2" 45 Colt Gunfighter is No. 58811." "USFA Ser # 58988, .45, 4 3/4, BP frame, walnut grips. Ordered new from USFA around 2005/2006." 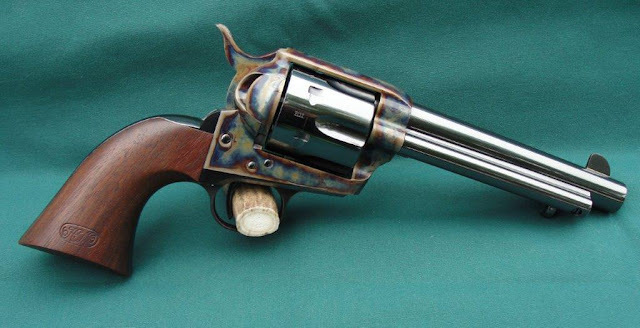 The aged finish of a "Gunfighter" model built on a BP frame. On the premium and Prewar guns these are what we have come up with so far. Start at 21XXX and continue to the end of 28XXX and into early 29000 range.. Some of the late 28900 rage were Buntlines. 28958 and 28959 were 7.5" b/c engraved guns. I'm unaware of any 29XXX but have been told there are some. 22154 USA gun* cone firing pin, transitional guns by the # out of order? 22180 parts gun* transitional guns by the # out of order? Check out the back strap ears and bottom back of the hammer mating done here! 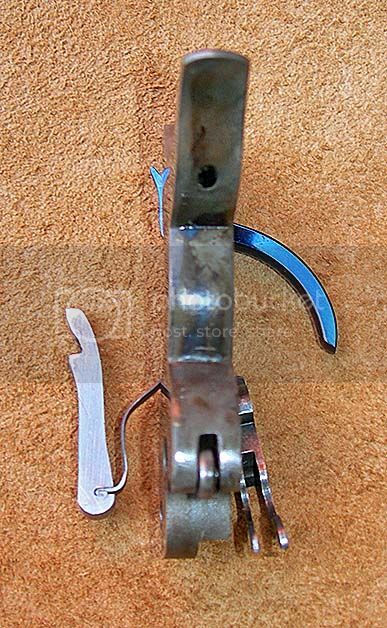 Hammer to back strap ears? Easy give away here. If they are NOT a perfect match in profile it is likely not a USFA USA gun. Look just above and below the two back strap retaining screws and base of the hammer/hammer strut. Then see if the hammer profile and back strap ears match as they do on this Colt. USFA is typical even better! More to come...but that seems to be the basics. 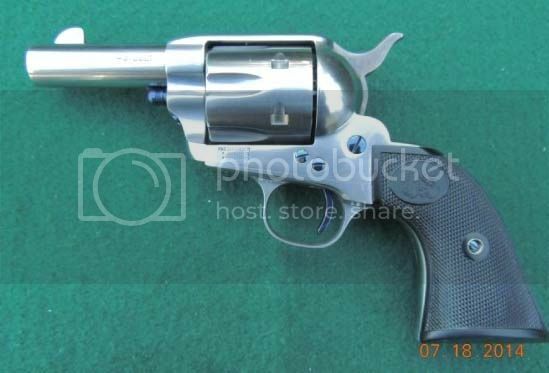 Uberti guns and "parts guns" in general? Don't dispair. The "parts guns" are nice guns. Just not the quality of the all USA built guns and not worth the premium prices that the USA guns demand now and will continue to do so in the future. 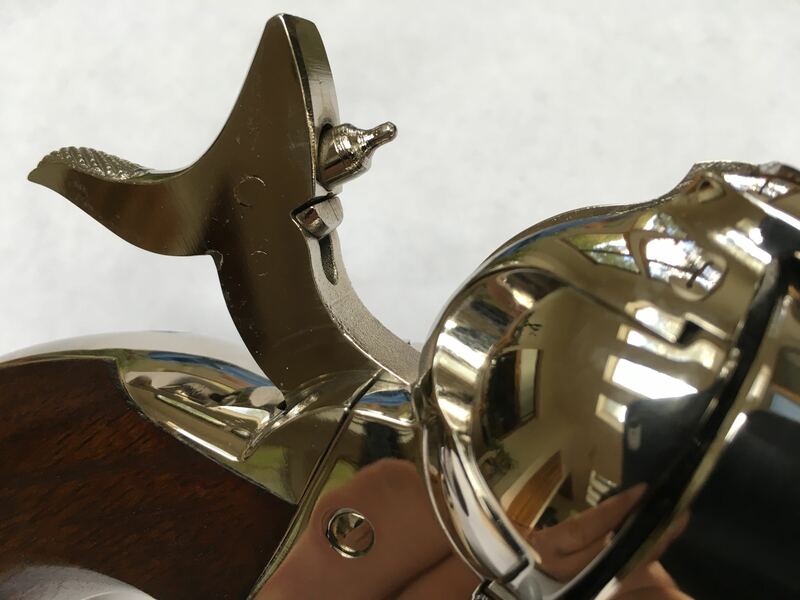 The master SAA pistolsmiths @ USFA, Turnbul Restorations, Adams and Adam's engravers and other selected and exceptionally skilled craftsmen turned Uberti parts into some beautiful SAA guns and then roll marked them as USPFA and USFA guns. 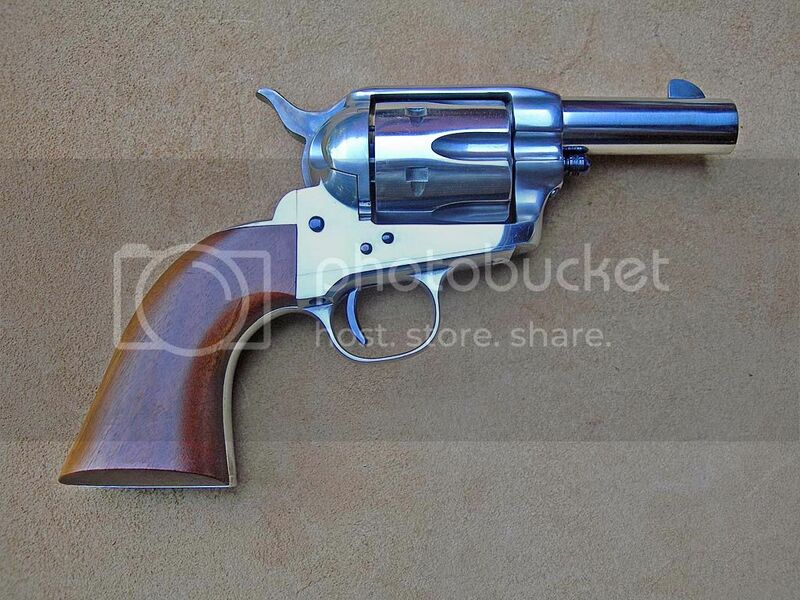 But they are in fact beautiful Uberti guns or a combination of Uberti parts and USA frames. You as a consumer have to decide where the actual value is. The effort behind this post is to give you the knowledge to make educated buying decisions for the USFA brand name. In the world of the Internet and a world wide economy...knowledge is priceless. And I'd don't mind saying it here....buying USA be it USFA or Colt...it doesn't matter...there is a certain pride of ownership and quality in both. What follows is a classic examination of a "USFA" gun. 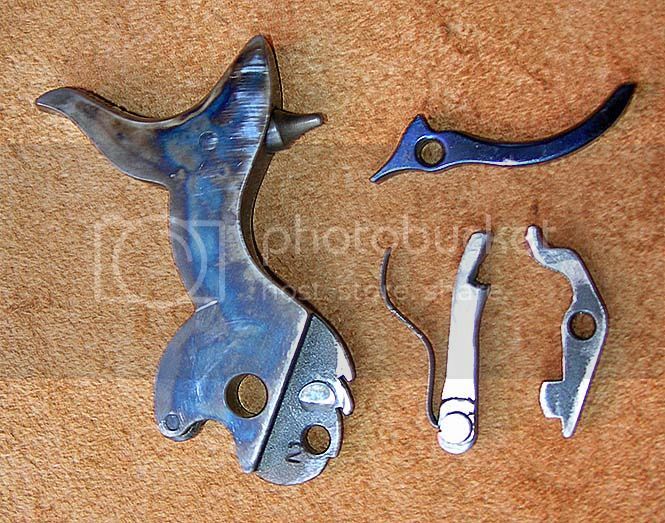 When I bought it, it looked like this; I replaced the US grips with the one piece wood. 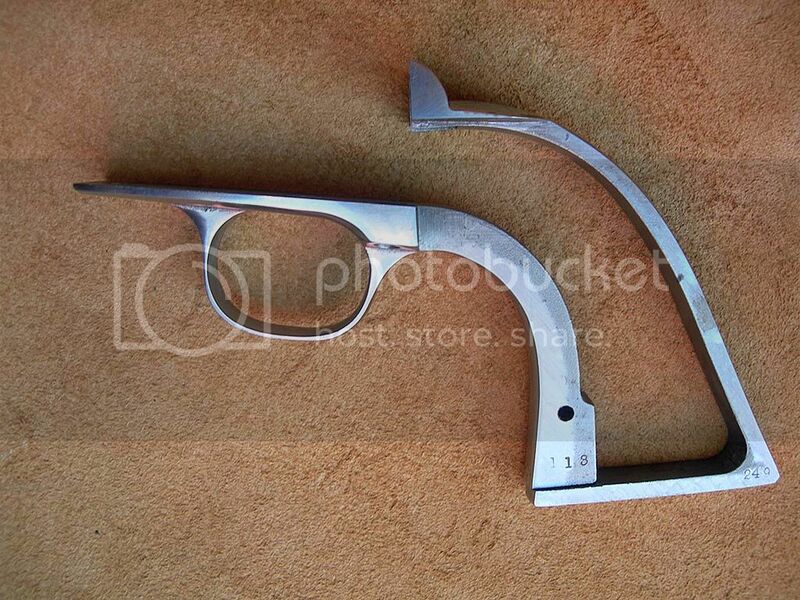 The gun is question has a Uberti loading gate window. Here is my 2cents...worth what you paid for it. and lastly one point I missed until now. IMO the frame started out as a SAA not a Sheriff's model. 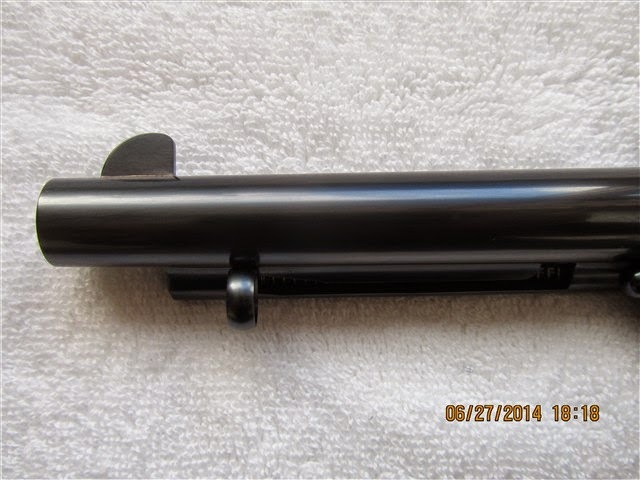 Take a look at how badly over buffed and rounded the frame is on the right side front at the barrel. compare the previous pictures and what is posted below. Great example of a early USPFA gun and the paper work.